What makes the UC Davis Pastured Poultry Farm unique? The farm is a poultry focused research, innovation and outreach hub for non-conventional free-range and pastured poultry producers (layers and broilers), master gardeners, backyard enthusiasts, educators, academia, students, food producers, food buyers, food safety and animal welfare auditors. Why do we need a pastured poultry farm? The poultry industry is currently undergoing radical changes in the ways poultry products are being produced. “Non-traditional” methods such as pasture production are becoming increasingly popular. Several challenges such as food safety, animal health and welfare, and environmental issues, are associated with raising poultry on pasture. Production practices (coop design, disease management, animal welfare). This sector of poultry production has been under-served by academic institutions and, to our knowledge, the UC Davis Pastured Poultry Farm will be the only educational and research center offering such a comprehensive approach of pastured poultry production in the Western United States. Where is the farm and what does it look like? The University provided ~0.5 acre of irrigated pasture for this project, located on the south side of campus. An interdisciplinary team of faculty members, staff, and undergraduate students has been constituted (more details under "About Us"). In 2018, a new mobile coop design was designed and constructed by undergraduate UC Davis engineering student Ruby Chen (class of 2018). 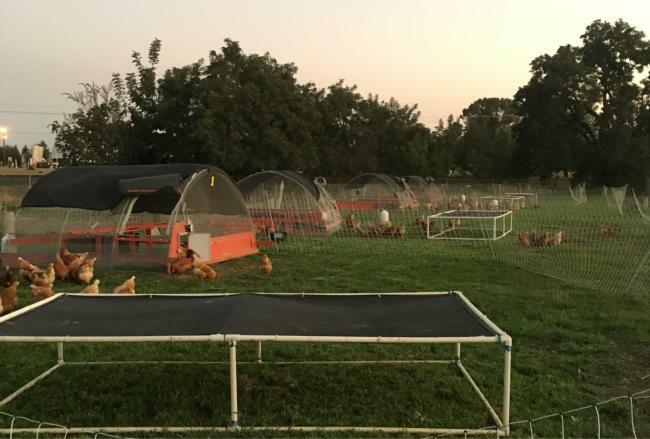 This new coop holds about 50 hens, with designs aimed to optimize mobility of the coop while maintaining biosecurity, welfare, ergonomics, and cost. We have plans to implement this design in Nepal in late 2018. Our new laying flock (150) arrived on January 16, 2018. Eggs are sold to the UC Davis Dining Services and donated to the Yolo Food Bank. We are proud to supply all shelled eggs for Scrubs, the UC Davis School of Veterinary Medicine Cafe! Did UC Davis have previous pastured poultry farms? In 2017, four customized "chickshas" were designed and constructed by undergraduate UC Davis engineering students under the guidance of Dr. Deb Niemeier. These structures were designed to be moved manually by 2 people, holding ~45 hens. The design aimed to optimize production, biosecurity, welfare, ergonomics, and cost (see Poultry Ponderings Edition 9 for more information on the chicken coops). 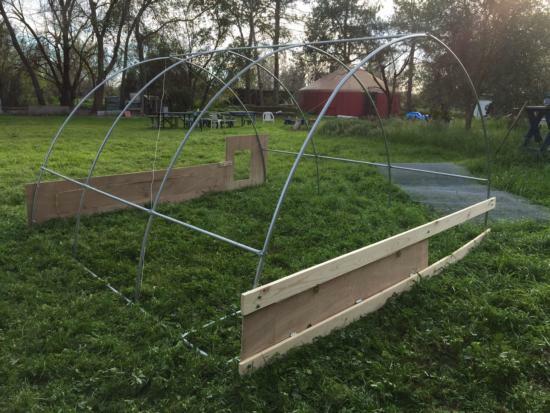 The smaller design has applications in areas worldwide where resources to move a larger coop around a pasture may not be available. Our second laying flock (180) arrived on April 25, 2017. The chicks were part of an organic poultry industry funded nutrition study that will investigate the use of black soldier fly larvae (BSFL) as a methionine feed supplement for organic layers (see Poultry Ponderings Edition 10 for more information on the project which was supported by the Organic Poultry Industries, Methionine Task Force). After the nutrition study ended, eggs were sold back to the UC Davis Dining Services and donated to the Yolo Food Bank. These hens were processed at a workshop in May 2018 with the help of Dr. Dan Famini at Santa Rosa Junior College, then sold to the UC Davis Dining Services. In 2015, a customized "eggmobile" was designed and constructed by the UC Davis Sustainable Design Academy. The "eggmobile" was designed to house ~150 hens and was moved around the pasture by hitching it to a truck. Our first laying flock (150) arrived on September 22nd, 2015 and started egg laying in February 2016. Our eggs were donated weekly to the Yolo Food Bank up until September 2016. These hens were processed by our team in early September 2016 with the help of Dr. Dan Famini at Santa Rosa Junior College, and then donated to the Yolo Food Bank. If you have questions/suggestions or comments, please contact Dr. Maurice Pitesky at mepitesky@ucdavis.edu.